Osmo Top Oil is a food safe oil wax combination for treating furniture and providing a food safe wood finish to kitchen worktops made of wood. Once dry the microporous surface does not crack, peel, flake or blister. It is safe for humans, animals and plants and can be used on children‘s toys. Osmo Top Oil is ideal for protecting interior furniture and work surfaces made of solid wood or edge-glued panels (e.g. kitchen worktops, desks, shelving etc.). Also suited to cork and OSB. The finish is resistant against wine, beer, cola, coffee, tea, fruit juices, milk and water. These types of liquid spillages will tightly bead on the surface without leaving any marks, simply clean by wiping with a cloth. 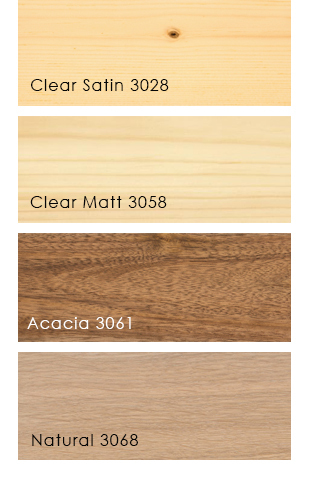 Osmo Topoil is available in 4 different finishes - Clear Satin and Matt, Acacia and natural top oil (see right). Please ensure this wood top oil product is applied to bare wood surfaces which are clean & dry. Any scratches and small holes can be filled using the Osmo Wood Filler. Furniture should be sanded to no finer than P220 to allow the oil to penetrate. Apply thinly along the wood grain with a lint-free cloth. Allow to dry for approx. 8-10 hours with good ventilation. Repeat as above 2-3 times. When renovating, one coat applied to the clean and dry surface with a lint-free cloth is usually sufficient. Click the button below to add the Osmo Top Oil - 0.5L to your wish list.